Thank you for the comment Becky. I absolutely love your blog too. And as for your pictures from the field, well, I love them. Anyone who gets a chance then take a look. In time I will build up my library, hopefully. 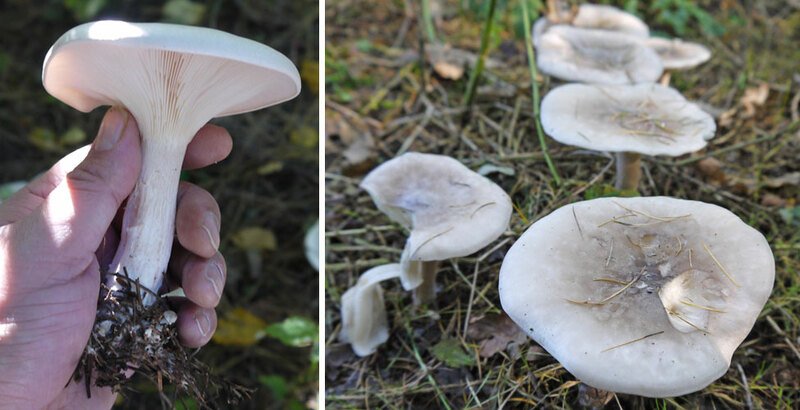 The frustrating thing about mushroom hunting is quite simply – winter. Come on spring, summer and autumn! Getting outdoors and actually enjoying a few days in the brush with some friends and brewskis is the best way to spend a weekend in the summer, Im excited to get out there with my new knife. Just seen the link to Becky’s flickr gallery, will definitely have a look, enjoying perusing the past posts here – excellent.! Good tip Alia. 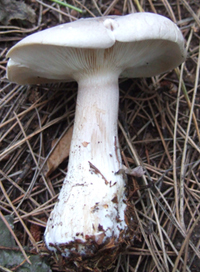 I’ve heard milk helps a lot in reducing bitter tastes in certain wild mushrooms. I have decided to harvest these this year. I think I shall treat them like Lepista nuda and first boil them and throw away the water. I am sure I could digest them, but don’t want to upset any rare visitors. The two mushrooms are so similar and LN were wonderfully chewy and ‘meaty’ following my processing, so perhaps the Clouded Agaric will be similar. I intend dehydrating them subsequent to the boiling. Hope they will serve as humane meaty bits in stews and soups throughout the following year. That’s a brilliant idea – so much so that I think I’ll do the same. They will serve well as meaty fillers in soups and stews for sure. And because they are so common and often in large numbers it’s a good opportunity to stock up. I tired these this Autumn. First a small amount – no ill effects, then I completely over did it because I loved the taste of the first one and because nobody else wanted to risk eating the huge haul I brought in. I really at a lot, a whole piled plate of them. Although there were no major “issues” I did experience some gastric disturbance and the most horrendously smelly farts. In future I will eat in moderation.